Keep your craft items and art supplies at your fingertips with this crystal-clear vanity organizer. Sturdy and stable design. 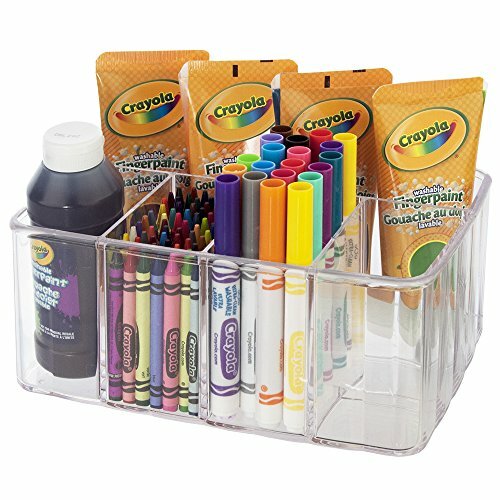 Five compartments hold markers, crayons, paint bottles, glue bottles and sticks,and much more. Compartments are deep so items stand upright and won't fall over. Perfect for placement in a deep art or craft room drawer. Products stay upright and easily accessible so you won't have to fumble through cluttered drawers to find what you need. Made in USA. GET ORGANIZED! Keeps art supplies and craft items within easy reach. Perfect for deep art and craft room drawers. MULTIPLE COMPARTMENTS! 5 compartments separate and organize your markers, paint bottles and more. MULTI-PURPOSE USE! Also makes a great organizer for personal care items in the bathroom. VERSATILE AND STYLISH! Crystal-clear premium quality plastic looks great on any desk, vanity, craft table, or countertop.